Flourtown Bakery just started a Facebook page announcing its specialties like Flag Day cakes, Father’s day shirt cakes and strawberry shortcakes. On a sign at the checkout counter announcing the Facebook page is a QR code (a unique, small black and white checkered square) Customers can scan the pattern with their smartphones to jump to and follow the Bakery on Facebook. 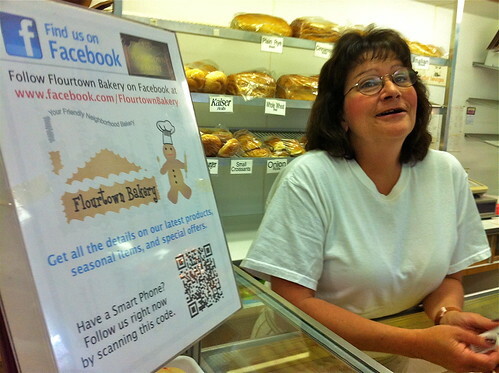 Beth Alio, Flourtown Bakery, Montgomery County, PA. Watch video here. 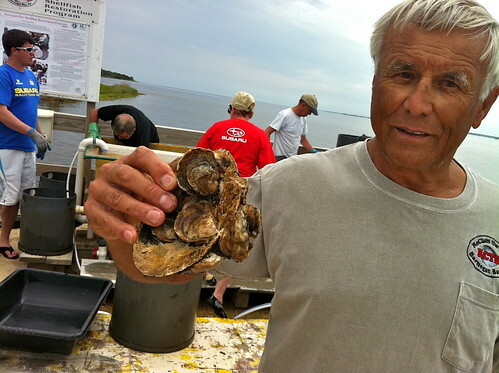 Martin Sedlacko, of Forked River, New Jersey volunteers with ReClam the Bay, an environmental organization with an educational focus that grows up seed clams and oysters until they are large enough to be transferred to protected reefs in Barnegat Bay. The native oyster and clam populations died off substantially in the 1950s and ‘60s due to land development in the shore community and environs, Sedlacko explains. One significant factor is eutrophication; nitrogen (found in fertilizers, acid rain) from runoff contributes to excessive underwater plant growth. In the subsequent dieback and decomposition process, bacteria consumes the oxygen the shellfish depend on. 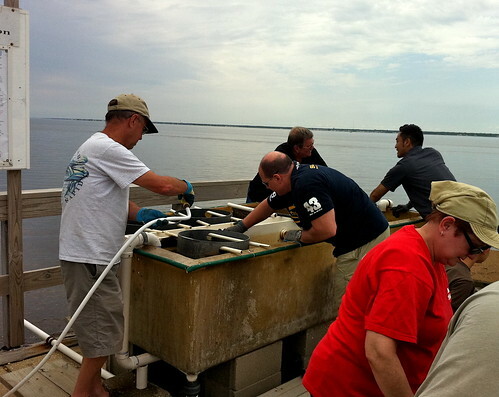 On Monday afternoons, volunteers gather at a shellfish station on Barnegat Bay off of 24th street in Seaside Heights, not far from the extensive Island Beach State Park on the south side of Long Beach Island. They clean the growing shellfish and introduce bay water into several tanks called “upwellers.” The juveniles feed on plankton in the water. The Seaside Heights station is one of ten such locations on the bay that participate in the Barnegat Bay Shellfish Restoration Program, a partnership between Rutgers University/Ocean County Cooperative Extension and the New Jersey Department of Environmental Protection. Employees from Subaru of Cherry Hill complemented the regular volunteer contingent at the Seaside Heights station on a recent Monday afternoon. 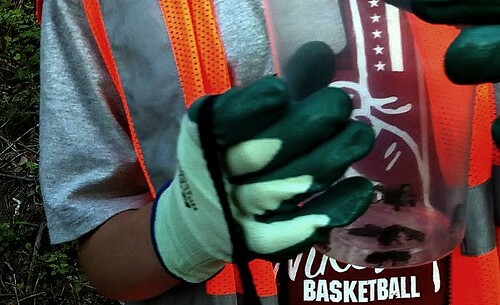 In the morning the employees had participated in a bay cleanup. According to one employee, Subaru partners with the Ocean Conservancy because this kind of volunteering is a good fit with its brand and the values held by its customers. WHY ARE YOU MOVING THE TOADS ACROSS THE STREET? "So they don't keep keep running over and don't keep dying out. Because they're so small it takes them a while and they keep on getting run over by cars" Volunteer boy. "This week is the peak week for the toadlets to be migrating back to the woods. The toads are coming from the reservoir. That's where they were born a few months ago. The adults mated in the reservoir and this is the product of their experience. This is what would be called a reverse migration. The adults left [the reservoir] after they were done mating. And these are the babies migrating from the reservoir to the woods.The detour is set up each night from 7 to 9 pm. We have a permit for about a month." WHAT GROUP IS DOING THIS? "The toad detour. Last night we counted two thousand toadlets and there were also a few thousand that we didn't count They were all over the street. So you have to be very careful where you step." Lisa Levinson, Toad Detour, on Port Royal Avenue and Hagys Mill Road in Roxborough, Phladelphia, near old Philadelphia Water Department reservoir. Levinson is a co-founder and the director of Public Eye: Artists for Animals, "teaching compassion for animals through the arts." Watch video here. Artist Chuck Connelly curates the [stunning] Chestnut Hill Gallery show that just opened featuring his oil paintings, the projected light work of Ted Victoria, the lamps and gears of Harry Anderson and the salt print nudes of Hal Hirshorn. 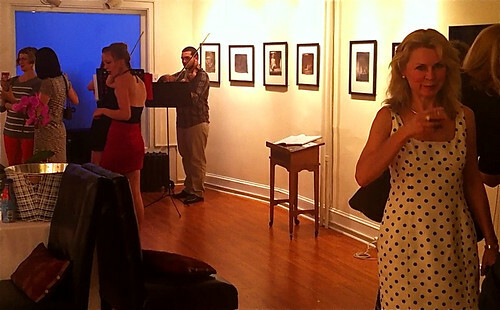 Featured in the video collage [CLICK HERE] of the artists' reception are Connelly, Victoria, Anderson and Owner-Gallery Director Joseph Borelli. Scott Chassy of Washington,D.C. 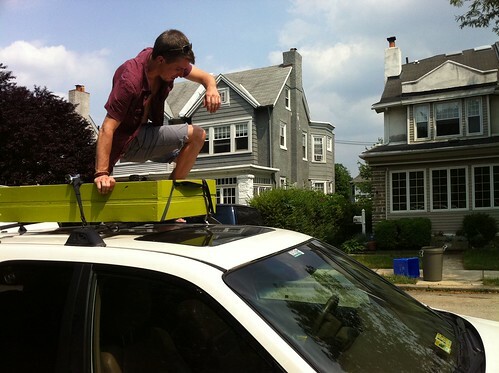 secures the wooden frame of a portable horseshoe bean-bag game to the roof of his car. He and seven friends were preparing for a tailgate party at the Phish concert across the river in Camden. They last saw Phish together fifteen years ago. Watch video here. "I grew up in Philadelphia and when I came back- the differences between there and here – people are more friendly here even though that’s the city of brotherly love. I went to this gas station and a sign as big as this building said “Self Serve” I went to grab the pump and this big monster just knocked me out of the way and said, “Hey, man, that’s my job to pump the gas.” So I let him pump the gas. And I went in to pay and I should have known it was a bad neighborhood because there’ a guy behind bulletproof glass inside. So I’m sitting there waiting for him to finish pumping my gas so I can pay for it. He pumps it and I pay the guy and I’m looking and the guy reaches in the window and steals a pack of my cigarettes off the dashboard. I used to box so I don’t want to be afraid of anybody but I can tell you I was a little bit afraid. So I came out and I’m thinking should I say something to this guy or should I not say something. I figured my life is worth more than a couple dollars of cigarettes. I didn’t say anything. But then he grabs me and he says, “Hey, man, where’s my tip?” I had seven dollars in my hand from change so I figured, the guy just stole my cigarettes, do I have to give him a tip, too? I figured what the heck, I gave him the seven dollars. And I went around to get in my car. Here comes this other guy. He puts his head in the door so I can’t close the door. And he says, “Hey, man, where’s MY tip?” I said, “See your partner.” He said, “He ain’t no partner of mine.” Well, by this time, I pretty much about had it. So I kind of politely told him what to do with his head because I was closing that door. And when he didn’t move I started to close it. He moved his head and I drove away. That was the last time I was in Philadelphia." 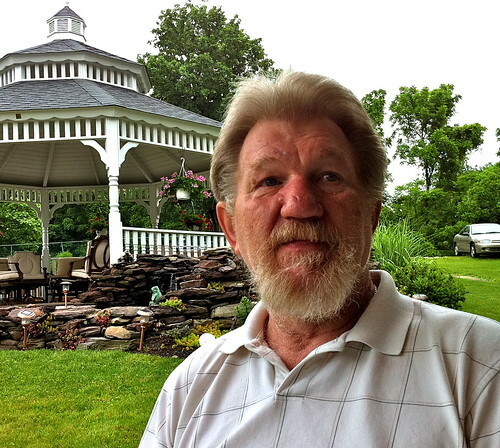 Tim Davis, who lived in Philadelphia until he was sixteen, now proprietor of a bed and breakfast in Washington, PA south of Pittsburgh. Watch video interview here. As she slept, a young woman was bitten on the cheek by a spider. But it wasn't a spider and if it was, it wasn't any ordinary bite. 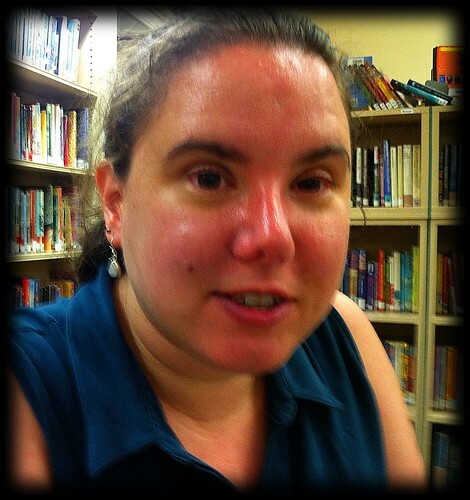 It became inflamed and, alarmed, she went to the emergency room. The doctor, too, was alarmed. An x-ray revealed that whatever bit her had laid eggs and they were beginning to hatch and work their way out through her skin. Or so it was according to a story retold with convincing feigned veracity by Linda Lee, a folkore PhD student at the University of Pennsylvania who was giving a talk on urban legends at the Chestnut Hill library. Watch video here. Yertle's almost eight and a half. She's a green winged macaw. She's been with us since she's been 3 months old. And she is able to say, "I love you", "banana", "How are you? ", "Take me out", "Help me!" WHAT DOES SHE UNDERSTAND? Everything. She does not like her harness. She puts up a fight to get in her harness but we have to because she'll fly away. So she fights until we get it on and then she's happy to come out. Right, Yertle? DOES SHE GET A CHANCE TO FLY EVER? Oh, she flies around the room in the house. She's pretty good at it. Normally most people keep the wings clipped. We let her fly in the room because it's good exercise for them. And she gives good kisses. C'mon, give me a kiss. WHERE IS SHE NATIVE TO? Florida. You can't bring birds in from Costa Rica or any other place anymore. SHE WAS BORN AND BRED IN FLORIDA? Yes, she came up as a kind of a blob to a bird store in New Jersey and when we saw her she was three months old. Her feet weren't strong enough to hold on to a perch yet so she slept laying down on the bottom of the cage. She was so cute sleeping on the bottom of the cage, that's why Sari (Sari's her real owner) fell in love with her. Say hello to the nice man. Yurtle: "Hello." Well that was a good start. She also says "Hi" And when the phone rings she says, "Hello! Hello!" 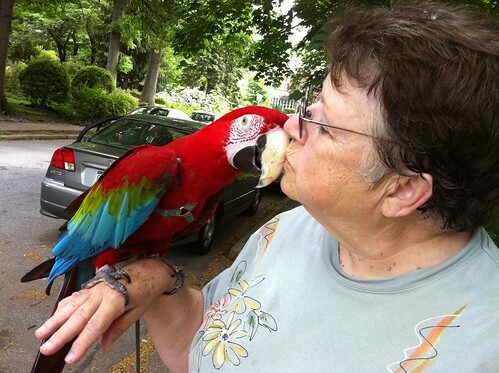 In Mount Airy, Ruth Hoxsie with Yertle Ann Yentele, a green winged macaw, who earned the name "Yentele" because she'll repeat anything she hears. Watch video here.